Ann "Umma Annie" (Pomi) (Dewlaney) Kokesh, is now peacefully amongst the angels, suffering no longer. She was a friend to everyone, and shared kind, positive words on a daily basis; an extremely proud, loving mother and grandmother (Umma); a dedicated, loving wife; a workhorse for the Redwood City School District for over 25 years; a fashionista, who matched her shoes perfectly to each outfit she wore; a doggy mom; a fabulous gardener; a fisherman (woman), who hauled in a tuna that weighed way more than her; a positive, inspirational force against her horrible disease, lymphoma, for almost 20 years! She was an inspirational role model and had an incredible amount of strength and tenacious attitude towards all things that confronted her. Her smile and spirit will continue to shine bright in the many lives she touched. 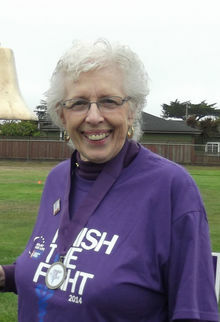 Annie is survived by her husband, James Kokesh; her two sons, Bill and Dennis (Patricia) Dewlaney; daughter, Sherolyn (George) Mejia; four precious grandchildren, Andrew Dewlaney, Kristin, Karissa and Kailynn Mejia; brother, Donald (Kathy) Pomi; and a number of relatives and very close friends. Annie cherished the memories of those who preceded her in death, including her parents, Albert and Florence Pomi; her brother, Henry Pomi; her sister, Susan Smith; her mother- in-law, Margaret Kokesh, as well as many aunts, uncles, cousins and many friends. She was a gift to all who knew her and she will definitely be missed by all. Private graveside services will be held at Mt Hope Cemetery in Pescadero. If you would like to offer condolences to Annie's family or share your memories please visit Miller-Dutra Coastside Chapel.